Doesn't it seem absolutely absurd that we're talking Christmas already? I swear it was just Christmas 2017! While it's my favorite time of the year, I'm just not ready yet! Unfortunately the calendar doesn't care about my feelings so it's happening whether I like it or not. One thing I'm looking forward to is our annual #kashklinxmas party! This year is our 10th annual shindig and it's going to be AMAZE. Are you guys planning any holidays parties this year? Now that the weather is finally cooling down in LA it's time to get our layer game on AND I'm so happy to make use of this festive red jacket I got in August during the Nordis anniversary sale. It's also great over big sweaters which is ALWAYS so hard for me. I feel like East Coast gals make it look SO easy and I end up looking like a sausage stuffed into all the things! 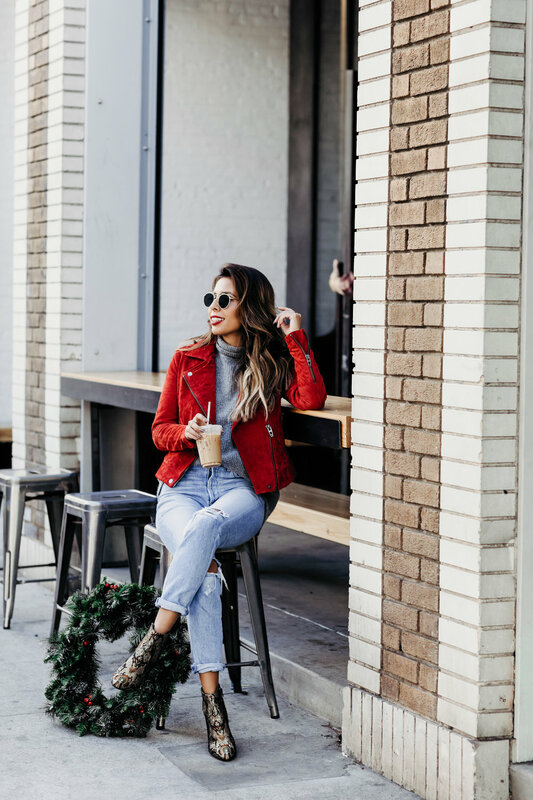 Since I've shared a bunch of dressed-up holiday looks over the past few weeks, I thought you guys would appreciate this casual look especially cuz the booties are under $50!! Between IG and the blog, you guys are constantly asking about these jeans - I wrote about them in my fall denim guide and cannot suggest them enough for any petite gals looking for a relaxed fit that won't overwhelm your body!